Almost 70% of the people we asked told us the first thing they do when they need to learn something new for their jobs is Google it and read or watch what they find. We are all “just Googling it,” and not just because it’s expedient. We’re doing it because, in many cases, Google is all we really need. Less than 50% say they look specifically for a course, but they’re inclined to do so on their own. Fewer than 12% said they ask their L&D or HR department for courses or other resources. By a 3.5 to 1 margin, people tell us they believe their own self-directed learning is more effective in helping them be successful at work than the training provided by their employers. More than 70% of the people we’ve surveyed say they’ve learned something for their job from an article, a video or a book in the last 24 hours. Informal learning needs to be valued more highly. Most workers told us they believe that up to 60% of the knowledge and skills they use at work come from informal learning. 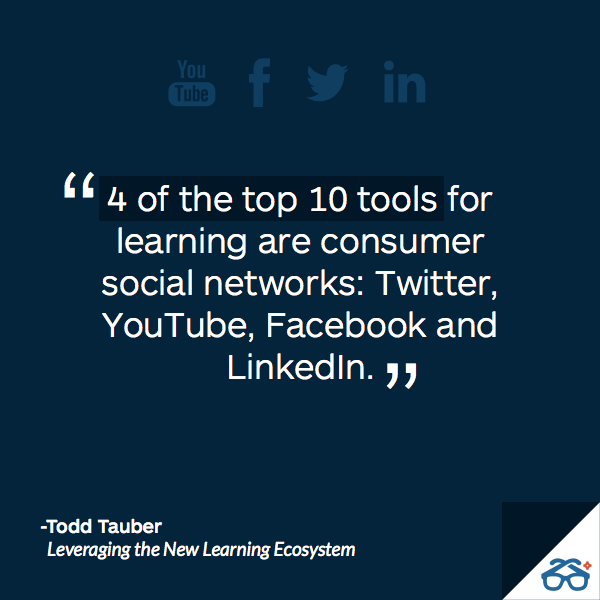 4 of the top 10 learning tools are consumer social networks. Additionally, only 4 the top 25 tools for learning are enterprise products, and only one is an LMS. Learning is not limited to L&D anymore. Learners are adults who have a good idea of what they need. In many cases, they say they don’t need a day-long course or even a 2-hour workshop or a 1-hour video. They just need some targeted articles and a few short video clips — just enough to get started. It’s time to start embracing the ‘random’, ‘just in time’, and ‘just because learning’ and open our learning and development tools to include the entire learning ecosystem. Learn how Degreed can help you leverage the entire learning ecosystem here.